SEOUL, Dec. 21 (Yonhap) — South Korean girl group AOA will release its first full-length album, the group’s agency said on Wednesday. The seven-member act will roll out “Angel’s Knock” on Jan. 2, 2017, FNC Entertainment said in a press release. The announcement comes four years after the girl group’s debut in 2012, along with a new promotional poster put up on the band’s social network website. “The LP will show every aspect of AOA’s musical skills accumulated in the past four years,” FNC Entertainment said in the statement. The band became the present seven-member group after one of its members, Youkyung, left in October 2016. 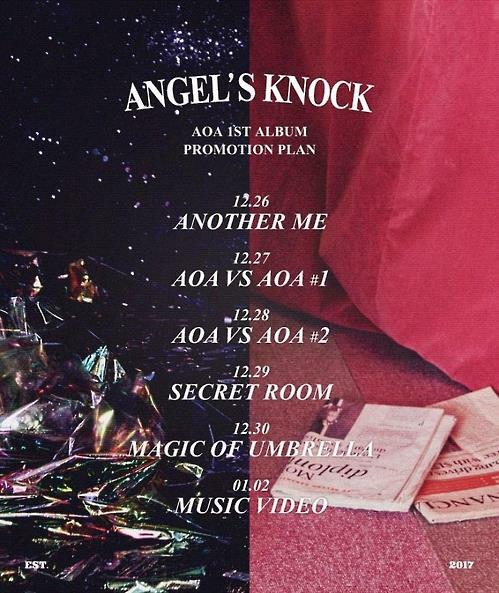 Provided by FNC Entertainment, the promotional poster for AOA’s upcoming LP “Angel’s Knock” was released on Dec. 21, 2016.